Using the keyboard to control ISIOControl quickly and conveniently TV, radio and Internet capabilities of ISIO devices from TechniSat. 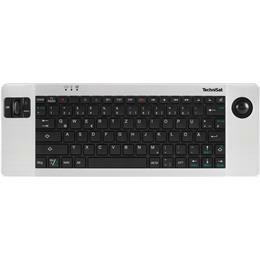 With this cordless keyboard with a remote control feature allows you to write such easy access to your e-mail or call your favorite websites, apps, media libraries and video-on-demand from services. And it all wirelessly via radio! Suitable for all TechniSat ISIO devices.